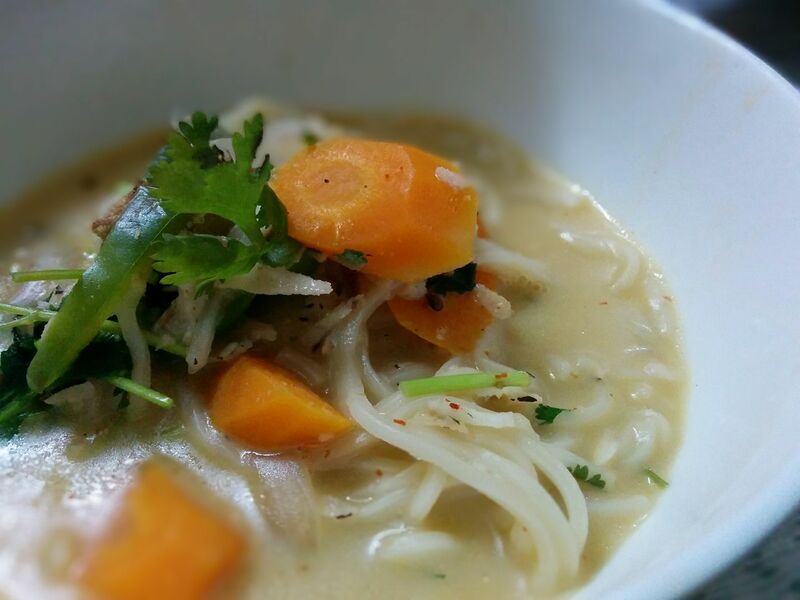 A very healthy recipe consisting of noodles cooked in coconut broth with Asian flavours and flavours of Thailand such as galangal, lemongrass and chilies. Take a skillet and add oil in it, add garlic and sauté. As the garlic start to fragrant add the ginger and stir. Add dry red chilies and sauté them. Add mushrooms and sauté well. Add coconut milk and stir well. Cook on medium flame for 5-7 mins. Add broccoli and carrots. Add 1 cup vegetable stock and cover with a lid. Cook for 10 mins and add salt & pepper according to taste. Soak the rice noodles in hot water till the time vegetables are cooking. Drain the noodles and add them in the broth. Add the lemongrass and cook for 2 mins. Tear the coriander leaves and add in the broth. Give it a final boil and serve hot.